Weekend in Dublin Cost Breakdown: How much money for 3 days in Dublin? Home Europe Ireland Dublin Weekend in Dublin Cost Breakdown: How much money for 3 days in Dublin? In December I went to Dublin together with my boyfriend. Read why you should go to Dublin in December and read what we did during our time in Dublin. Are you thinking about going to Ireland’s capital yourself? Do you wonder how much spending money for 3 days in Dublin you need? I break down my weekend in Dublin cost for you! Luckily, my times of an absolutely budget traveler are more or less over. I do not have to skip any meals and worry about being dead broke when I return from my travels. But that doesn’t mean, I spent my money like crazy! I still watch my budget and try to stick to it. After all, there is always more to explore and more places to go to. How much does a weekend in Dublin cost? We spend 5 days, 4 nights in the capital of Ireland. We arrived in the afternoon on Thursday and left Monday evening. We were a couple, traveling together and splitting the costs. Much was paid in advance and we took some cash with us. Our costs for a long weekend in Dublin can be divided as following. Beginning of September, I received a newsletter from Ryanair. They informed me they had set up a new route. 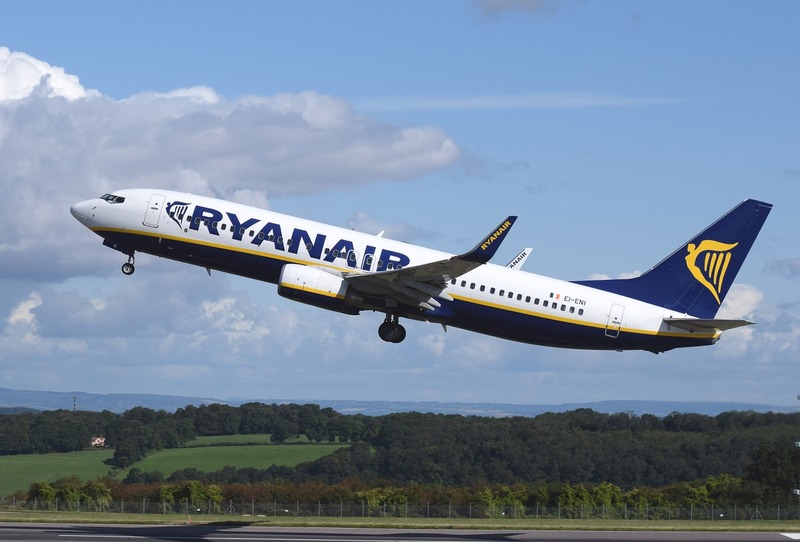 Amsterdam- Dublin would now be an option with this low budget airline. Although Amsterdam is not the nearest airport from where I live, I went to their site and checked things out. I found flight as cheap as €9,99 and decided to go for it. Keep your air fare low with a budget airline. We flew from Amsterdam to Dublin and back, including credit card fees and taxes and what not, for €40,76 total. It was deducted from my credit card in September and I didn’t think about it anymore. We didn’t take any checked in luggage, because this will cost you €15 per bag. We both took the maximum of 1 carry-on luggage of 10kg. We didn’t buy any priority boarding or paid services and kept our flying expenses to a minimum. Always be the first to land a deal to fly to Ireland? Read and learn about flight deals newsletter subscriptions and how they work. After I booked the plane tickets, I started browsing the interwebs for a place to stay. I finally found a room via Airbnb. We spent 4 nights in a room of a modern apartment complex just 1 block from O’Connell Street, which was really centrally located. We were charged 4x €65 for the room and an additional €38 for Airbnb service charges. Looking for a different place to stay? Consider to sleep at an Irish Castle in Dublin, recommended by Jamie from the Daily Adventures of Me. Looking for another place to stay? Check Dublin Hotels here. 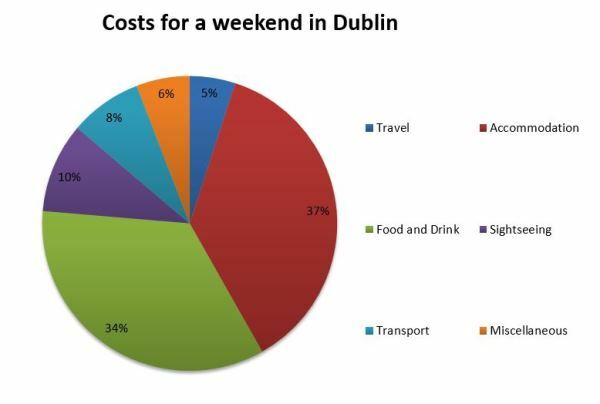 The food costs for a weekend in Dublin can be divided in the 3 main categories. As we were staying in a room with a small fridge, we went to the supermarket to buy some food and drinks. We stayed next to a Tesco supermarket and close to a Lidl supermarket. The later was obviously cheaper. We spent a total of €25 on things from the supermarket. The things we bought for this amount were: Irish cheese (which was delish! ), ham, Cola and Sprite, crisps, bread, yoghurt and water. By buying our own food for breakfast, we kept our food costs for a weekend in Dublin low. We also went out 1 time for a real Irish breakfast. We had our breakfast at Beshoff Fish and Chips on O’Connell Street where we both had the mini breakfast for €5,50 each. When in Dublin, you cannot pass up on the occasional beer or two. We didn’t go clubbing or pubbing until very late, but we did have a few pints over diner. 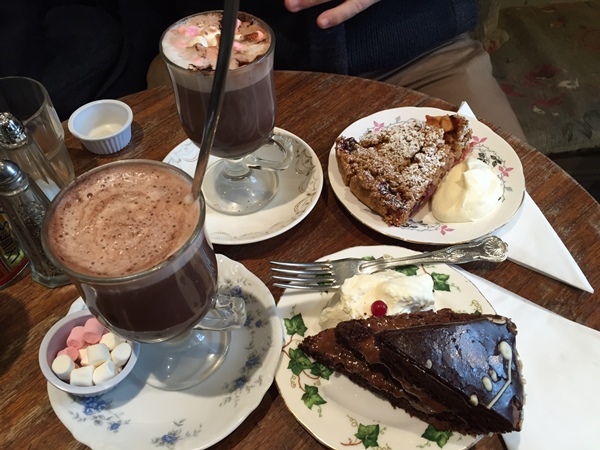 We also had a cup of tea in the pub and indulged in a lovely chocolate delight at Queen of Tarts. Looking back, I’m actually surprised we didn’t have a proper lunch every now and then, but I guess we were too busy exploring Dublin. We just didn’t feel the need to go out for lunch. Price of a pint of beer: ranging from €5,00 in a normal pub to €5,95 at Temple Bar pub during the day. This is more expensive in the evening. We went out for dinner every night. We went to the pub for a main course and a beer to go with it. We had desserts once and this was consequently the most expensive evening out of 5 diners. Of course we wanted to see something of the city. I always feel like these things can make city trips expensive but the sights are what draws me to a city and of course we had to probe around Dublin a bit. Some things were paid in advance via credit card, other things we paid for in cash. Visit Trinity College. The famous University grounds of the city are free to explore. Experience pub life. Ok, you might want to buy a pint or two but the atmosphere and vibe come for free. Shopping. We wandered around the many shops of Dublin. As it was 2 weeks before Christmas we strolled around the Christmas market and the different malls with lovely Christmas decorations. Irish music and dance at the pub. We wanted to go out for a bite to eat and settled for a pub. Little did we knew that they had (free) live Irish music and Irish dance performance that night. A bit of Ireland’s music and dance culture and it all came for free. Chester Beaty Library. The Library is free and as it was raining, we wanted to check it out. Unfortunately, it was a Monday and it’s closed on Monday’s. Go figure. Grounds of Dublin Castle. We went to the Castle to check it out. We walked around and read all the signs. As we didn’t really know what the inside would be like and didn’t read very positive reviews online, we didn’t take the tour. 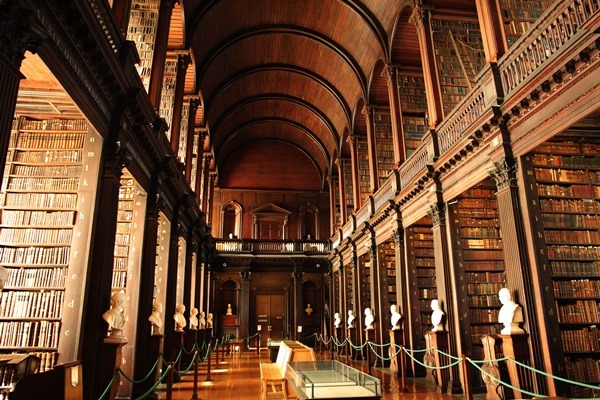 Book of Kells and Trinity Library: € 10 per person. I wanted to see the Library. I needed to see it. It was actually the main thing on my list so this was a no brainer for me. Get your fast-track access to the Book of Kells here. 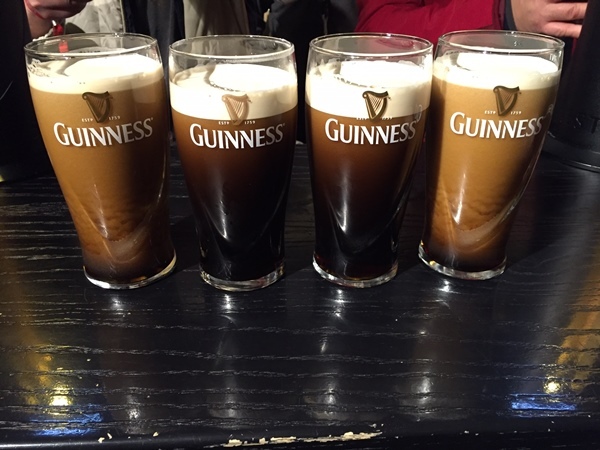 Guinness Storehouse: €18 per person. One of the main advertised attraction in Dublin must be the Guinness Storehouse. Great indoor activity and we had fun drafting our own pint and looking out at Dublin from the Sky Bar. Book your priority entrance ticket + free pint here. Christ Church Cathedral: €6,00 per person. I did find the price to enter the churches a bit steep. You only spent half an hour in the church and look around a bit. But it was a lovely church and I’m glad I could contribute into maintaining it. St Patrick’s Cathedral: € 6,00 per person. Also quite the price for a church but I do think this one was worth it. If you have to pick one, choose St. Patrick’s would be my advice. We spent almost 1.5 hours inside and I found the information provided very meaningful. All in all, I think this wasn’t so bad. We could have crammed in a lot more paid things to do, but we made some decision. Dublinia: €9,50 per person. Learn more about the history of Dublin and Ireland. It can be combined with a visit of Christ Church Cathedral but we didn’t really know what Dublinia was and opted out of it. Old Jameson Distillery: €20,00 per person. For me it was a decision between the Guinness Storehouse and the Old Jameson as both would blow my budget too much out of proportion. Dublin Zoo: €17,50 per person. The Zoo sounded as a very interesting Zoo to visit. But it was December. And there was so much more to see and do. So we didn’t go to the Zoo in Dublin. Find more Kid friendly things to do in Dublin. Dublin Castle Tour: €7 to 10 per person. We had just missed the tour group, so we decided to look around the grounds for free and skip the tour of the apartments. Malahide Castle: €12,50 per person. We went to Malahide by train and walked up to the castle. I see a pattern here, because we missed the last entree and we couldn’t go in the castle. It looked magnificent and I might have forked over the €12,50 per person to see the interior. Dublin Pass: prices vary per day. 1 day is €59, 2 days is €77 and 3-day pass is € 94. The Dublin Pass isn’t a sight on its own, but it does allow you to enter the above mentioned attractions for free. We wanted a bit of flexibility for our schedule and we decided to buy the tickets separately. We did spend a few euros on transportation in and around Dublin. I found Dublin quite big and my feet were killing me at the end of each day. Here is a list of our transport costs for a weekend in Dublin. 1 day ticket for Dart and Short hop train: €11,40 per person. We wanted to take the train along the cost and explore the little towns. We walked to the train station and spend all day on the train. 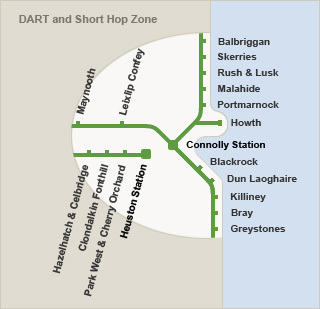 Stops for the Dart train, image by Irish rail. I think the above sums things up pretty nicely. But there are always some hidden costs for a weekend away. You have to keep that in mind when budgeting the costs for your trip. They might not be specific costs for a weekend in Dublin but I want to be complete so I throw them in anyways. Costs for getting to and from the airport at home. We had to drive 100 km to get to the airport and back. This costs about €15 for gas money. We also parked the car at the airport. Not the parking of the actual airport, but some long parking service in the vicinity. We paid €31,50 to park the car for 6 days. Total costs for getting to the airport at home: € 46,50/ per person €23,25/ per day €9,30. We didn’t buy many souvenirs but we do have a habit of buying postcards with the lovely pictures we cannot take ourselves. I also send 1 postcard to my parents every time I go away for more than 1 night so we bought a couple of postcards and 2 stamps. I’m a terrible tipper and have no idea of the right etiquette for this. As we paid most of our things with cash, it was easier to round the amounts here and there. I hope I was able to give you a good insight in my weekend in Dublin costs. You can see what the different parts of a trip to Ireland’s capital will cost you, if you do the same things. All in all I do think it’s a bit on the high end for a city trip but I do feel we did everything we wanted and even ate out every single night. We thought we might order a kebab some night, but we enjoyed our pub food that much, that we just kept going to the pub. I feel the pubs and the beer was part of the Dublin experience and that came at a cost. 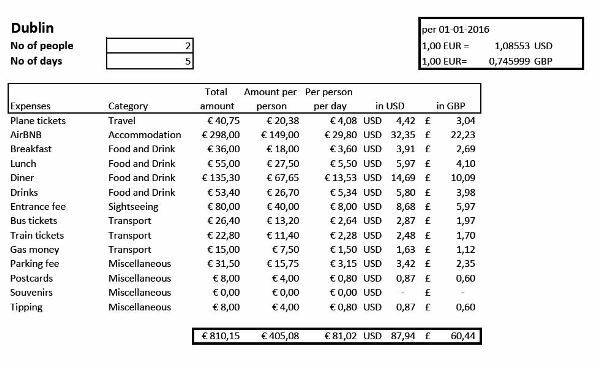 As you can see from the above image, both our accommodation and our food and drinks, make up for a third of our expenses each. We might have saved some money if we would have stayed at a hostel, but we did have the comfort of having our own place. In case you want to know more about my travel expenses, please check out my Cologne expense report, or my costs for a weekend in Alicante, or travel expenses for Barcelona. Need more help with your vacation budget planning? Check the vacation budget planner. What do you think? Did we spent too much? Do you keep taps on your travel expenses? Please share your experiences of the weekend in Dublin cost below. This post contains affiliate links. If you decide to book through my link I will earn a small commission at no extra cost for you. Uffizi or Accademia Museum in Florence? The Trinity Library is a must! Especially when you have a Library Bucketlist Wanderlustink !